Herbs are wonderful allies for holistically addressing postpartum depression. A great place to start is the herb St. John’s Wort. St. John’s Wort (Hypericum perforatum) is considered one of the best Western herbs for mild to moderate depression. It is also the most studied and widely used herb for alleviating depression, and is used extensively in Europe as a first line of treatment. American herbalist Susun Weed notes that St. John’s Wort “thrives in the hottest, sunniest locations and spends the summer soaking up the sun so she can give it back to you when the outer or inner skies are grey.” Susun recommends one dropperful of the tincture, taken one to three times daily and up to every two hours to brighten your mood, move through grief, and ease the physical pain of depression. In my personal experience, St. John’s Wort helps improve my mood when I’m feeling defeated, pessimistic, and weepy. The drawbacks are that it can take up to a few weeks to take effect, the dosage is individualized, and quality & effectiveness vary across brands. Sheila Humphrey recommends seeking out standardized products from Germany, as these have formal studies supporting their safety and effectiveness. Experiment with different brands and different forms of Hypericum until you find what works best for you. Don’t give up! Susun Weed cautions that capsules are not as effective as tinctures. If you want to try a tincture, I recommend Herb Pharm St. John’s Wort Extract. Start with a very small dose. Though 300 mg three times per day is the standard dose, many women report this to be too strong. 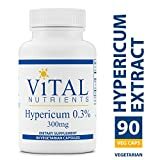 Both Source Naturals St. John’s Wort Extract or Vital Nutrients Hypericum Extract offer St.John’s Wort capsules standardized at 300 mg. If you tend to struggle with depression chronically, try a low daily maintenance dose. Increase dosage in acute situations such as PMS or when under extra stress. St. John’s Wort affects how you metabolize other drugs. If you are on any prescription drugs, be certain to speak with your doctor. Remember: There are solutions to postpartum depression and it can go away. Even if you feel you don’t have it that bad — you don’t have to settle. Take one small step, and when you have it down, take another small step. And know that you are not alone!